Israeli police have released a Hamas cabinet minister, several hours after detaining him at a checkpoint on the outskirts of East Jerusalem. Khaled Abu Arafa, minister of Jerusalem affairs, was stopped on his way to open a new office, Hamas officials said. Mr Abu Arafa, a resident of the city, had been detained before by Israel in the past, they said. He is among officials who became ministers last week after the militant group won January's Palestinian poll. Mr Abu Arafa told the BBC that during the five hours he was held, no-one questioned him. He said he was treated roughly, handcuffed and made to sit in a shipping container for some time. "[The Israeli authorities] have a policy of obstructing the work of Palestinian officials. We're used to this. They are trying to let us know that we are at their mercy, to be detained and released as they wish," Mr Abu Arafa told the BBC. Mr Abu Arafa was detained at a checkpoint at the entrance to al-Azaria, a suburb of East Jerusalem where his office is based. An Israeli police spokesperson said he was detained because he was on his way to an area that he did not have permission, as a Jerusalem resident, to visit. The minister says he was going to pick up furniture from the office of one of his predecessors. His bodyguard told the BBC that their car was stopped by Israeli border police and the minister asked for his papers. He said there was an argument and Mr Abu Arafa was dragged from his car. The BBC's Middle East analyst, Roger Hardy, says the brief arrest was symbolic more than anything else, but it is part of a bigger confrontation, whose outcome is far from certain, between Israel and the new Hamas-led government. He says the Israeli government has many ways of putting pressure on Hamas, which does not recognise Israel's right to exist. 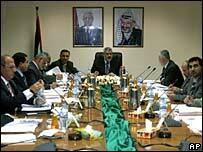 These include hindering the free movement of Palestinian officials. To judge by Thursday's events, our analyst says, Mr Abu Arafa will not be able to travel between East Jerusalem where he is resident and his new office on the edge of the city, in what is technically the West Bank. East Jerusalem is at the very heart of the Israeli-Palestinian conflict. The majority of its residents are Palestinian, and Palestinians hope to make it their future capital. Israel says the whole of Jerusalem is its indivisible capital. East Jerusalem, like the West Bank, has been occupied by Israel since 1967. Israel annexed East Jerusalem in 1981, but its claim to the area is not recognised internationally. Under the plan for further unilateral disengagement proposed by acting Prime Minister and Kadima party leader Ehud Olmert, East Jerusalem and large areas of the West Bank, especially the area around the city, would remain under Israeli control.